Dog-Loving Little Girl Fighting Brain Tumor Gets a Visit from Almost 40 Police K9s! for neighbors and spending time with pups whenever she can. 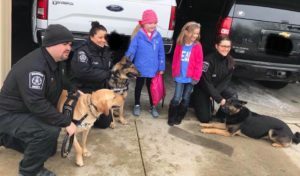 area sent out dogs from their K9 Units to meet Emma at her home! – a dream come true for any dog lover! ready to fight crime and help cheer up other people in the world! sometimes humans can be really cool too. Way to go, officers. and leave a picture or two of your dog! Almost 40 Police K9s! appeared first on iHeartDogs.com.